The Virginia football team kept a good summer recruiting roll going in the state of Florida when quarterback RJ Harvey pledged to the Hoos last week. That marked the sixth pledge from a Sunshine State prospect in this recruiting cycle. What the commitment didn’t do, however, is give the Cavaliers their first RJ on the roster. The Hoos already have one of those and he could be climbing to a new level this season. The “99 Virginia Football Thoughts Before Kickoff” series continues. While RJ Harvey is a rising senior in high school, that was an eternity ago for UVA redshirt junior R.J. Proctor. He finished up at Liberty Bealeton High School in Virginia back in 2015. Since then, the former three-star recruit has redshirted a year, found a spot in the rotation for a year, and emerged as a multi-game starter for year. Now, Proctor has the potential of two full years still ahead with the Cavaliers. That brings us back to Proctor, who is just entering his junior season. He started one game as a sophomore and appeared in eight games overall back in 2016. He didn’t lock down a position, but did get valuable experience at guard. In 2017, he started the season’s first two games at right guard but then fell out of the starting lineup. He battled back to start three more times in consecutive games against Pittsburgh, Georgia Tech, and Louisville later in the year. He tallied 22 knockdown blocks on the season. Through two seasons of on-field play, that’s six starts and plenty of snaps. The Pitt-GT games turned out to be a potential preview of 2018. In those two games, Proctor started at left guard instead of on the right side. He recorded a season-high four knockdown blocks in the game at Pittsburgh. Fast forward to preseason practice and that’s where you’ll find Proctor now. He’s part of the starting line that opened fall camp: Chris Glaser (LT), Proctor (LG), Dillon Reinkensmeyer (C), Jake Fieler (RG), and Marcus Applefield (RT) lined up left to right as practice opened. That’s two seniors, a junior, and two sophomores. Proctor checked in this season as an absolute physical specimen. 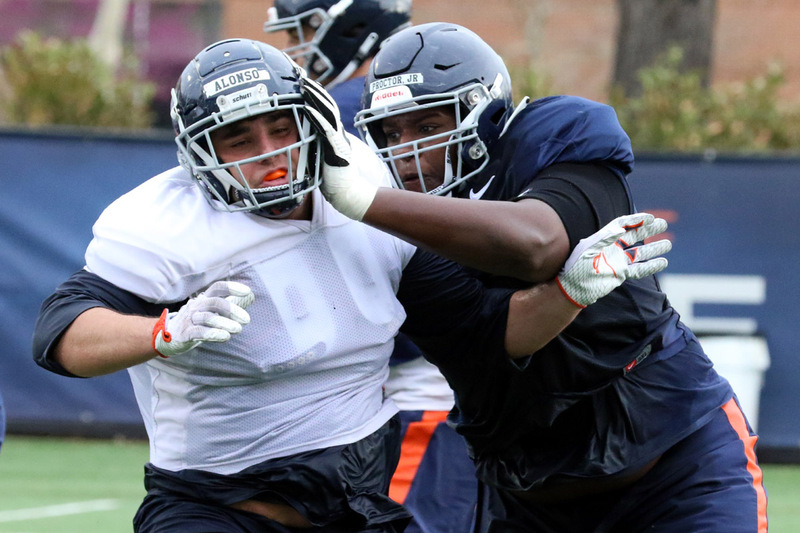 He’s at 6’4” and 335 pounds, making him the biggest lineman up front for the Hoos, but he still appears to have retained his overall movement skills and agility. That’s up from 315 pounds in 2017 and 305 pounds in 2016. He reportedly put up a team-high 37 reps on the 225-pound bench press at the end of summer workouts. That would have placed third at the NFL Combine this spring. In other words, Proctor is older with age, wiser with experience, bigger with weight, and stronger with leverage. That’s a recipe for a potential breakthrough season. That would be a good thing for the Cavaliers. If he can sustain his performance through the season, that would buy more time for sophomore Ben Knutson to continue to progress at comfortable developmental pace. That’s true for other younger players on the roster too, particularly the freshmen as the staff figures out who to funnel into which spots. That’s the type of succession planning that coach Bronco Mendenhall mentions so frequently that allows for long-term program health. With Fieler starting as a senior at the other guard spot, Proctor could solidify part of the interior for 2018 (and potentially two years) if he can put together a strong campaign. The key there will be to hold off challenges from the likes of Knutson, Glaser, and Reinkensmeyer among others. Of course, Tyler Fannin’s health could play a role in the competition across the board. The staff wants its best five options out there together and will shuffle linemen around to make that happen. Right now with Fannin out, that meant shifting Reinkensmeyer back to center and slotting Glaser in at left tackle. If Fannin returns to play center, however, Reinkensmeyer could slide back to left tackle or elsewhere due to his versatility. That could also open up Glaser as a potential option somewhere too. Long story short: Proctor is entering a critical juncture in his career, but he’s positioned well to make a significant contribution. Where that goes will be part of the offensive line story in 2018.